Sub. 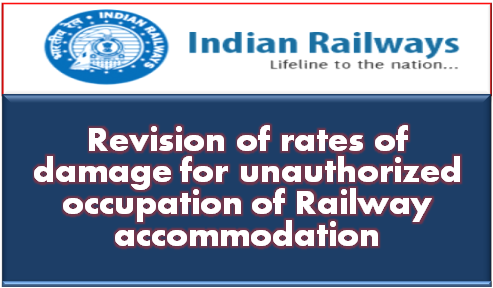 : Revision of rates of damage for unauthorized occupation of Railway accommodation. Ref. : (i) Board’s letter No.2018/Trans. Cell/Process Reforms/Estt. dated 05.04.2018. (ii)Ministry of Urban Development, Directorate of Estates’ O.M. No. 18011/1/2015-Pol.III dated 07.09.2016. Transformation Cell in Board’s office vide their letter No.2018ffransCell/ Process Reforms/Estt dated 05.04.2018 on the subject “Process Reform- Comprehensive Housing Policy” referring to ‘Conclave Sam park, Samanvay, Samvad held on December 16, 2017’, has directed all GMs/CAOs/DGs that full Board in its meeting held on 4th April, 2018 considered the issue of improvement in housing policy and approved among other items, implementation of telescopic penal charges in case of unauthorized retention of railway quarters in the line of GPRA (MoUD). Accordingly, it has further been advised that GMs/CAOs/DGs may evolve their comprehensive guidelines for uniform implementation at their end. The flat rates of licence fee (Standard Rent) for residential accommodation over the Indian Railways were last revised w.e.f. 01.07.2010, 01.07.2013 and 01.07.2016 vide Board’s letter No.F(X)I-2002111 /2 dated 26.12.2017 circulated to all Zonal Railways, Production Units etc .